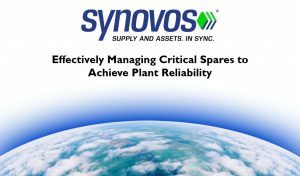 MRO Storeroom Management| Webinar: Managing Critical Spares to Achieve Plant Reliability | Synovos - Supply and Assets. In Sync. Despite rapid improvement in technology, one thing remains constant in manufacturing, regardless of the industry involved: the drive for improved MRO storeroom management. With plant reliability the goal, the reality is that many companies struggle in effectively managing MRO, particularly critical spares. In this webinar hosted by IMPO magazine, Synovos Reliability Engineer Steve Clayton explains why companies struggle with MRO, defines how critical spares impact plant reliability and provides an approach to mitigate associated risks. Download the free webinar here.